Our guide to Los Angeles will help you find the best vegetarian restaurants in Los Angeles California. Celebrities, movie cameras, and persistent paparazzi – these may be the hallmarks of present-day Los Angeles, but the second largest city in the United States has a rich and varied history that extends far beyond the glitter of the silver screen. California dreaming begins with Los Angeles. The sun, the beach, and the winking tinsel of Hollywood remain a permanent lure. Who can resist peeling down Sunset Strip in a convertible? Still, L.A. is a tricky city -- it takes know-how to navigate the sprawling neighborhoods and get into the top clubs. There are tons of great vegetarian restaurants in the city of Los Angeles, our city guide will help you find the best vegetarian restaurants. You may have a hard time deciding what to do in Los Angeles, but we make your decision easy. 1059 Broxton Ave, (310) 208-4444 - Falafel King is a vegetarian restaurant located in Los Angeles CA. 1076 S Fairfax Ave, (323) 936-5918 - Nyala Ethiopian Cuisine is a vegetarian restaurant located in Los Angeles CA. 11510 W Washington Blvd, (310) 398-6766 - Bharat Bazaar and Samosa House is a vegetarian restaurant located in Los Angeles CA. 1220 Firestone Blvd, (323) 582-9978 - Bobos Burgers is a vegetarian restaurant located in Los Angeles CA. 13016 San Vicente Blvd, (310) 451-1813 - A Votre Sante is a vegetarian restaurant located in Los Angeles CA. 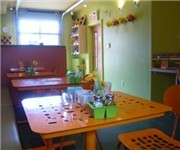 1436 W Jefferson Blvd, (323) 731-8344 - VegiSoul is a vegetarian restaurant located in Los Angeles CA. 1627 Colorado Blvd, (323) 254-8804 - Fatty's and Co. is a vegetarian restaurant located in Los Angeles CA. 1718 Westwood Blvd, (310) 966-1772 - Ambala Dhaba is a vegetarian restaurant located in Los Angeles CA. 1732 1/2 Westwood Blvd, (310) 474-1300 - Lucia's Catering is a vegetarian restaurant located in Los Angeles CA. 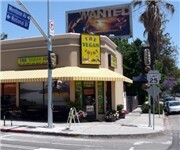 1918 W Sunset Blvd, (213) 484-9800 - Brite Spot Family Restaurant is a vegetarian restaurant located in Los Angeles CA. 2022 Violet St, (213) 891-1133 - Vegetarian Connection is a vegetarian restaurant located in Los Angeles CA. 3206 W Sunset Blvd, (323) 667-0116 - Flore Cafe is a vegetarian restaurant located in Los Angeles CA. 3217 Cahuenga Blvd W, (323) 851-8837 - Vegas Express is a vegetarian restaurant located in Los Angeles CA. 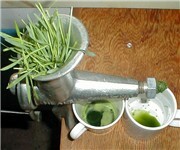 3526 W Slauson Ave, (323) 295-1517 - Mister Wisdom Wheatgrass Farm is a vegetarian food / grocery store located in Los Angeles CA. 5913 Franklin Ave, (310) 437-8112 - Real Raw Live is a vegetarian juice / smoothy store located in Los Angeles CA. There are plenty more vegetarian restaurants in Los Angeles. See all vegetarian restaurants in Los Angeles California.